Come one, come all to April’s Hurricanes Night Out fundraising event. 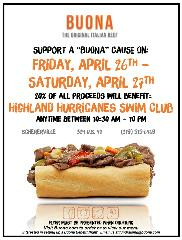 Buona Beef has graciously offered our club 20% of the sales from Friday, April 26th and Saturday, April 27th if people show the attached flyer or mention HHSC when ordering. This is a great way to help our club fundraise while meeting other swim families. Please spread the word and share the flyer! Please remember no soliciting is allowed on site.